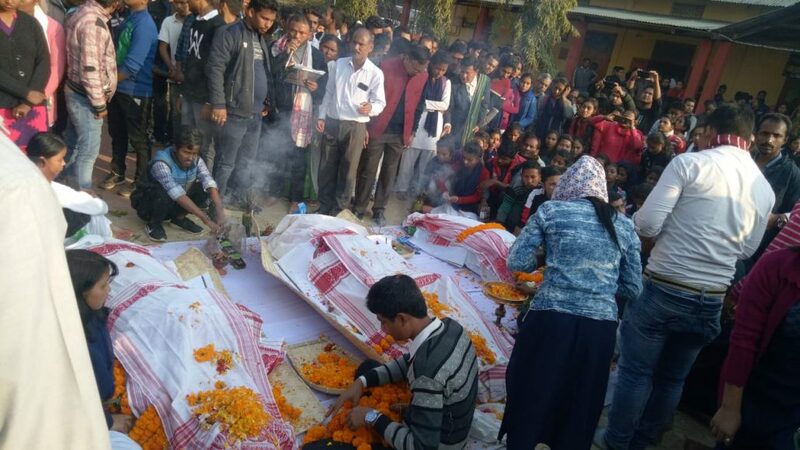 Three college teachers were killed and another one seriously injured in a road mishap at Dergaon in upper Assam’s Golaghat district on Wednesday night. Police said the three teachers of Teok based CKB College, Ranjit Saikia, Keshab Hazarika and Jintu Phukan died and another teacher Naren Saikia seriously injured after the Scorpio vehicle they were travelling in collided head on with an oil tanker on NH-37 at Kakodonga in Golaghat district’s Dergaon area. While Saikia and Hazrika died on the spot, Phukan succumbed to his injuries at Jorhat Medical College Hospital (JMCH). Critically injured Naren Saikia is undergoing treatment at JMCH. According to police, the teachers were returning to Teok in Jorhat from Dibrugarh University Inter-College Youth Festival being organised at Sarupathar College in Jorhat. The accident occurred around 11 pm due to poor visibility owing to heavy fog on the road, said a police official. Ranjit Sakia, who teaches History at CKB College, hails from Teok while Keshab Hazarika, a teacher in Assamese department of the college, is from Doomdooma. Jintu Phukan belongs to Katakipukhuri in Jorhat and he teaches Political Science in the college. Meanwhile, all the programmes of the youth festival at Sarupathar College, except the prize distribution ceremony, have been cancelled on Thursday following the incident.